Nurse as Tobacco, Now Marijuana Icon – We’re being duped again. 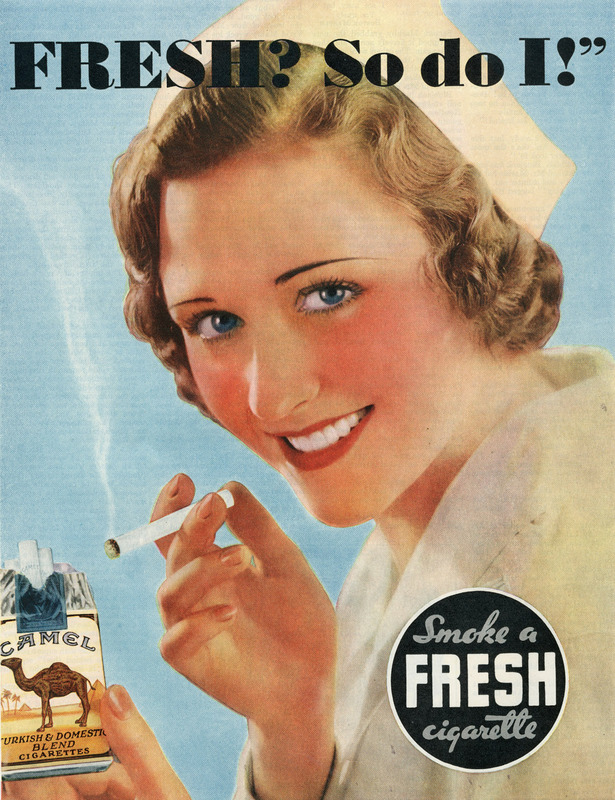 Tobacco companies used nurses, as well as doctors, to brainwash unsuspecting generations into smoking. Marijuana is using the same playbook. (Click images to enlarge). Not as demure as days gone buy, and updated to our digital and racier present, the “Nurse Tactic” of Big Tobacco is being used today to dupe us into thinking that smoking weed is okay. When you keep lifting the lid a little more on the methods and intentions of the marijuana industry, the parallels to the duping of America and the world by the tobacco industry become so blatantly obvious that it would be laughable if it wasn’t tragic. As states, like Kentucky, catch onto the farce that is the medical benefits of smoked marijuana, and build laws for use around just the non-high-inducing cannabidiol part of marijuana, the pot legalization proponents get all upset. The role of the Doctor in promoting tobacco and marijuana legalization has been thoroughly exploited. And with the doctor, of course, comes the nurse. The generations before us were so completely taken in by these manipulations that by 1965, around 42% of Americans were addicted to and smoking tobacco. The downstream health consequences are known to all as tobacco, to this day, remains the single biggest killer of Americans. So why aren’t we learning from the past? Well we are beginning to catch on, and the more we learn the more outraged we should be. As we wake up to the realities of this fraud, we should be aware that two wrongs don’t make a right. And three wrongs certainly don’t. We already have two addiction-based industries–tobacco and alcohol. We don’t need a third. And, this absurd justification that marijuana is less dangerous than alcohol has got to stop. Not because it can’t be argued that it is or isn’t. But because you don’t justify one wrong based on another. We, as an enlightened nation took on Big Tobacco and held them accountable, limited their advertising, and made them pay for some of the damage they do. Not enough by ten times, but some. We should be putting the same limitations and sanctions on alcohol–in advertising and reparations. But we certainly don’t need a third industry to beat back while the realities of what is being unleashed are proved. And Colorado is proving it already. “Just Say Know.” 6-Years Later, What Really are the Effects of Marijuana/THC Commercialization in Colorado? Marijuana Mills Drive Addiction. Resistance is Local. Health care costs far outweigh any sales tax revenues—Of patients that use marijuana, over 80% of them do not pay their hospital bills. Cautionary findings. Should the Commonwealth (or Any State) be in the business of promoting Marijuana?